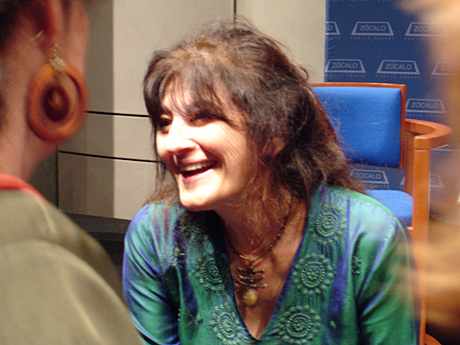 Ruth Reichl has achieved first-name-only status with a few friends and me. Not because we personally know her, but we had read and adored her memoirs (my reviews here and here), seen some of her magazine work and even followed her tweets. The former LA Times and NY Times restaurant critic and sadly now-former Gourmet editor in chief is an icon to those who know and love food. I mean, the Reichl part is just unnecessary at this point. So imagine how excited I am to tell you, I talked to Ruth! 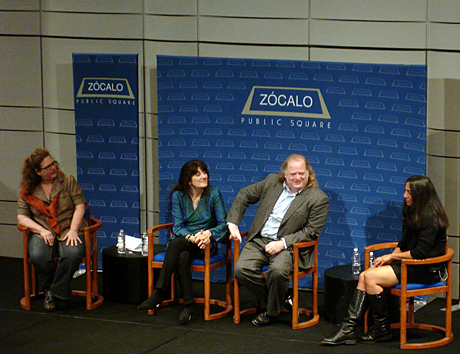 Evan Kleiman, Ruth Reichl, Jonathan Gold and Laurie Ochoa. 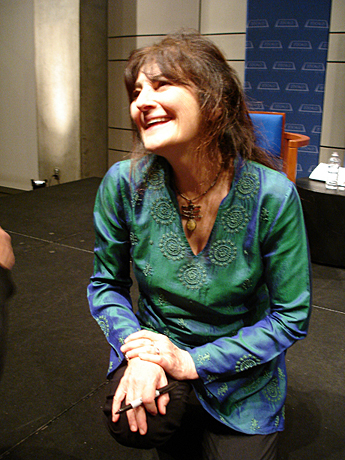 I went up to her after she spoke as part of a panel including Jonathan Gold (first food critic to win a Pulitzer) and his wife Laurie Ochoa, another editor of Gourmet. KCRW’s Good Food host Evan Kleiman led the discussion about the magazine, which Conde Nast folded in November. To be honest, I woulda been let down if she hadn’t worn something iridescent. So she set out to infuse politics, sociology and environmentalism into the magazine by encouraging the staff to come up with stories they cared about, instead of having everything come from the top down. 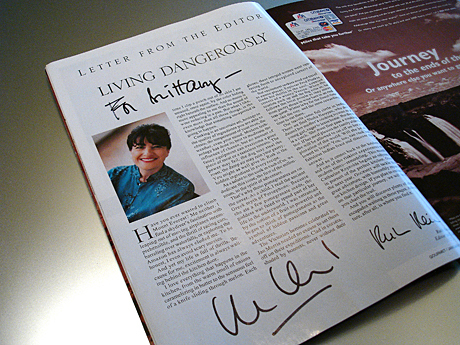 When Ruth took control of Gourmet, all of the articles for the next year were already done. She wanted the magazine to be relevant and adapt to the times. Sure, thousands of subscribers wrote to tell her how she had “ruined the best magazine in America.” But she trusted her vision, and hired people to handwrite responses to the naysayers. Ten years after she took the job, Gourmet had reached record circulation, but the economic recession and doubts about the future of print had sent advertising into a freefall. Without any warning, Conde Nast killed the magazine two weeks before the holiday issue would have gone to press. “The December issue was done and it was wonderful,” Ruth said. You could tell Ruth loved what she did and she thought of leading Gourmet as an honor and profound responsibility. She said she would “absolutely” want to be involved in a Gourmet Magazine of the future. Which, who knows, could end up being formatted for the anticipated Apple tablet. See full video of the Zócalo even here. Why couldn’t I go to LA a week later???? And that December issue! I’m heartbroken..
I’m still sad about Gourmet and to hear about that Holiday issue makes it even more so. Noooooo!! They can’t be gone.